Try serving this soup very chilled on a hot summer day! Danielle served it hot on a chilly day at Brookside Gardens April 16, 2014. Cut or break the trimmed asparagus into small pieces. Melt the butter in a 6 quart soup pot and add the chopped onion. Cook until onions are soft, about 5 minutes. Add the lemongrass and ginger and cook another minute, until fragrant. Add the asparagus pieces and broth. Cover and bring to a gentle simmer. Cook until asparagus are very tender, 10-15 minutes. Add the coconut milk and simmer another 2-3minutes. Puree the soup in batches in a blender or with an immersion blender until smooth. If the soup is very thick, add a bit more vegetable broth. Return soup to the pot to heat though. Just before serving add the lemon juice, salt and pepper. Adjust to taste, garnish with chopped chives or cilantro. Serves 4. 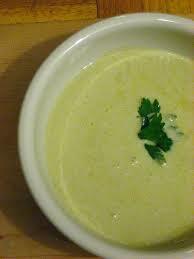 Note: this soup can be prepared several days ahead of time, but add the lemon juice after you reheat. This entry was posted in Recipes from Danielle's pantry, Soups, Vegetarian and tagged Asparagus, coconut milk, ginger, lemon grass. Bookmark the permalink.